The broad principles of landscape partnerships are fairly well developed and widely agreed (Sayer, et al; Scherr et al, 2014; Kozar et al., 2014). The state of landscape multi-stakeholder partnerships today is that partners are involved primarily because they view partnerships as necessary to realizing their own goals, in the context of multiple legitimate claims on land and resources by different stakeholders. But they are not particularly good at it. More than 80 different communities of practices have arisen to implement integrated landscape management from different entry points and with different philosophies, and there is much ‘reinventing the wheel’. Most trainings and tools are still stakeholder-specific, rather than designed explicitly to engage different stakeholder perspectives. Professional education remains focused on specific disciplines. There are few pathways for professional development as landscape partnership facilitators. Even the most seemingly successful landscape initiatives self-identify major weaknesses in their capacities for collaborative decision-making, monitoring and impact assessment, cross-stakeholder communications and other specific skills. If the rapid growth in landscape stewardship is to bear the fruit of its potential, we must become more serious about ensuring quality partnerships. It is important to find ways to streamline learning in the core competencies of individuals and institutions to participate in and lead landscape initiatives. Professional education and trainings need to be reoriented to include roles in cross-stakeholder facilitation. To enable the full effectiveness and scaling up of landscape initiatives, new types of organizations operating beyond the landscape must learn to partner with landscape stewardship platforms, such as financial institutions and national-level public agencies. 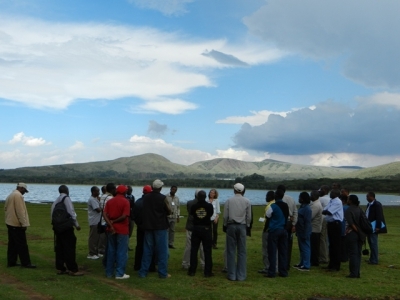 To address this exploding need for improved capacities for ILM, partners in the international Landscapes for People, Food and Nature Initiative are setting up national ‘learning networks’ for landscape leaders in Kenya, Ethiopia, Tanzania, Brazil and other countries; developing a ‘Landscape Academy’ (without walls) in Africa, and working with universities to strengthen curricula for ILM. National, regional and international cooperation in the development of such landscape partnership programs could greatly enhance landscape stewardship worldwide. Kozar, R., Buck, L.E., Barrow, E.G., Sunderland, T.C.H., Catacutan, D.E., Planicka, C., Hart, A.K., and L. Willemen (2014). Toward viable landscape governance systems: What works? Washington, DC: EcoAgriculture Partners on behalf of the Landscapes for People, Food and Nature Initiative. Sayer, J, T Sunderland, J Ghazoul, J Pfund, D Sheil, E Meijaard, M Venter, AK Boedhihartono, M Day, C Garcia, C van Oosten, and LE Buck (2013). Ten principles for a landscape approach to reconciling agriculture, conservation, and other competing land uses. PNAS 110(21): 8349-8356. Scherr, S.J., Buck, L.E., Willemen. L. and Milder, J.C. (2014). Ecoagriculture: Integrated landscape management for people, food and nature. Encyclopedia of Agriculture and Food Systems, 3, 1-17.
that provides observations and information on the emerging fields of landscape scale conservation, heritage preservation, and sustainable community development. Finally, my colleague Nora Mitchell, University of Vermont, and I are researching and writing on agricultural and rural landscapes in the U.S. with a focus on the challenges presented by the management of these resources.. For some U.S. case studies see our chapter in New Cultural Landscapes. Finally, I agree that as a field we need to view the management of landscapes as an important skill set and become serious about understanding the models that work, how transmit these skills and evaluating the outcomes.